British terrorist, Samantha Lewthwaite, aka “White Widow,” has reportedly been killed by a Russian sniper in Ukraine while fighting for the Aidar Batallion, a volunteer group for Ukraine's armed forces. The 30-year-old terrorist was allegedly killed two weeks ago, and Russian news service - Regnum - confirmed the report on Wednesday. However, some say the reports are untrue and 'utter garbage'. Ukraine’s armed forces have said that a Russian news story claiming that a British terrorism suspect — the so-called White Widow — was killed fighting pro-Russian separatists in Ukraine is an obvious fake. Regnum claimed that Lewthwaite, the former wife of a suicide bomber in the 2005 London attacks, had joined the pro-Kiev Aidar volunteer battalion as a sniper herself after entering Ukraine from Somalia. “There’s more chance of confirming that Bin Laden was fighting there,” Roman Vybranovsky, a spokesman for Ukraine’s national security council, told BuzzFeed News. “An Islamic terrorist fighting for a Ukrainian volunteer battalion while there are Chechen mercenaries on the [rebel] side is a more-than-eccentric idea,” he said. As proof, Toporov provided what he said was a scan of a fake South African passport that Lewthwaite, 30, supposedly used to enter Ukraine, which the Russian sniper allegedly found on her after he shot her. The photograph exactly matches a file photo of the fake South African passport that authorities in Nairobi say Lewthwaite used to enter Kenya in 2011 — including the angle from which it was taken and the light reflecting onto the passport. 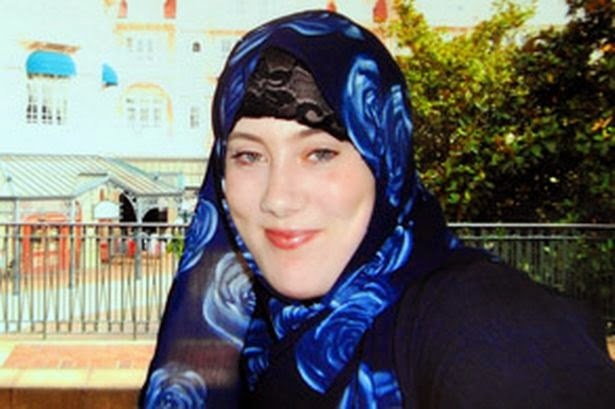 Samantha Lewthaite, daughter of a British soldier, got the nickname, ‘White Widow,’ after her husband, Germaine Lindsay, Jamaican-born British suicide bomber, blew himself up along with 56 others in the London bomb blasts of July 7th, 2005. The mom of four is deemed one of Britain’s and the world’s most dangerous terrorists and is on Interpol’s Most Wanted list. She is believed to be behind the September 2013 Westgate shopping mall bombings in Nairobi, Kenya which killed over 60 people. She has worked with several militant Islamist terror groups in Africa, including Somalia's Al-Shabaab, and some say, Nigeria's Boko Haram. So while many would not mourn to find she has been killed, the news may remain unverified until there is a body, or she strikes elsewhere. Kind of like the Shekau stories by the Nigerian military, right?